Look at me. I never thought I would see this day. I breathe easy, as I hold my throne at the National Postal Museum of the Smithsonian, Washington DC. 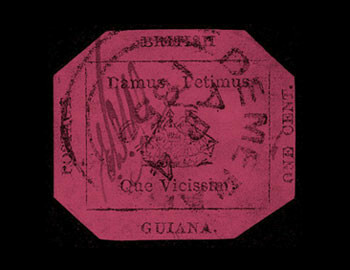 They call me “British Guiana 1 cent Magenta”, the rarest stamp of the world, one of my kind and they rightly have a profound reason to set their eyes on me. With a striking black ink printed on a majestic magenta paper and my corners clipped off to form a unique octagonal shape, they adore me even more.